This digital PDF file consists of four (4) pages, one of which is the first page shown to the left. 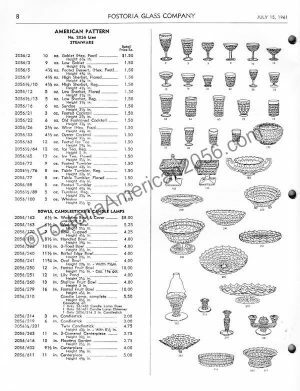 The other three (3) pages show the remaining Fostoria American pieces that were being produced circa 1961. The Catalog is actually dated 7/15/1961. This information would be a good resource for those enthusiasts that wanted to know what items were being produced during the early 1960’s. As you can see from the preview page I have posted, the Catalog & Price List will show a drawing of each piece being produced, along with its name and approximate dimensions – including the retail prices at that time. This report is in English only and is a digital PDF document. This report is a downloadable digital PDF file (non-editable) which will be available to you once your payment has been confirmed. You will then be sent an email letting you know that your file is ready for download. ***You will receive a digital PDF file for personal use only. You will need a PDF Reader, like Adobe Acrobat Reader, to open the file. If you do not have one, you can download Adobe Acrobat Reader for free at http://www.adobe.com/products/reader. Refunds/Exchanges: This is a DIGITAL PRODUCT, downloadable upon purchase. No physical product will be shipped to you. Since digital reports cannot be returned, there are no refunds or exchanges. Once I send you the file, the sale is final. Thank you.